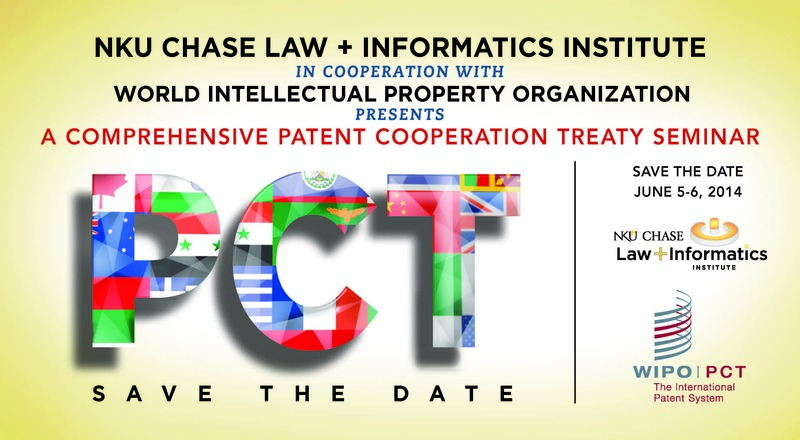 The NKU Chase Law + Informatics Institute, in cooperation with World Intellectual Property Organization (WIPO), will host a comprehensive Patent Cooperation Treaty (PCT) seminar on June 5-6, 2014 in Highland Heights, Kentucky, near Cincinnati, Ohio. The seminar will provide patent attorneys, patent agents, patent portfolio managers, paralegals, and law students with a comprehensive understanding of the PCT, an international patent law treaty established to unify patent filing procedures which protect inventions in the PCT’s 148 contracting states. The one and one-half day seminar will include patent portfolio management strategies for maximizing patent protection and minimizing legal expenses. The seminar will also include best practices, procedures for filing original patent applications in PCT member states, and news about changes related to the PCT. “This seminar provides a unique and valuable opportunity to learn the intricacies of the PCT process, and how to maximize the benefits achievable through the PCT. I’d highly recommend it to anyone involved in coordinating foreign patent protection,” stated Eric Robbins, a partner at Ulmer & Berne LLP and the chair of its Intellectual Property and Technology Practice Group. Mr. Robbins attended NKU Chase’s 2012 Comprehensive PCT Seminar, which was attended by IP professionals from around the globe. Featured speakers are Carol Bidwell and David Reed, U.S. consultants to WIPO on PCT matters. A total of 12.25 Kentucky and Ohio General CLE credits and Kentucky Paralegal Association CPE credits are anticipated. CLE credits for other states can be arranged upon request. Registration includes admission to an advanced patent searching workshop of the USPTO examiners’ databases, PubEAST and PubWEST, in NKU’s Steely Library, a USPTO designated Patent and Trademark Resource Center, on June 6, 2014 from 1:30 p.m. to 3:00 p.m.
Special thanks to WIPO, Frost Brown Todd LLC, IPAC, and CincyIP for their sponsorship. For more information, and to register, visit www.lawandinformatics.org/pct or contact Lindsey L. Jaeger at 859.572.7853 or JaegerL1@nku.edu. Join the conversation #globalip and #informaticslaw. covered business method review provisions. The final rules will be available for public inspection in the Federal Register Reading Room on Monday, August 13, 2012 and available online. The inventor’s oath/declaration, supplemental examination, post-grant review, inter partes review, and covered business method review provisions become effective on September 16, 2012. In addition, rules relating to section 6, regarding the new post-grant review proceedings affecting both ex parte and inter partes review. Those final rules are now available here. The USPTO authors an implementation blog which provides a great amount of information. Janet Gongola, Patent Reform Coordinator, authors the blog and most of the notices regarding the new rules. Earlier, On July 31, 2012, the USPTO published final rules in the Federal Register implementing the statute of limitations provision for Office disciplinary actions. These final rules as seen in the Federal Register are available here: OED Statute of Limitations Final Rules. As these regulations are published, the details of the impact of AIA begin to take shape. The USPTO has issued a Federal Register notice announcing public hearings and seeking public comments for a study required by the Leahy-Smith America Invents Act. All dates are coming up soon. Please respond to this notice, and distribute this call widely to all who may be interested. The USPTO is studying independent second opinion genetic diagnostic testing where patents and exclusive licenses exist that cover primary genetic diagnostic tests. Written comments should be submitted to genetest@uspto.gov. More information is available from Saurabh Vishnubhakat (saurabh.vishnubhakat@uspto.gov). (4) The role that cost and insurance coverage have on access to and provision of genetic diagnostic tests. The FRN is available here: http://www.gpo.gov/fdsys/pkg/FR-2012-01-25/pdf/2012-1481.pdf. General information about the AIA studies and reports is available here: http://www.uspto.gov/aia_implementation/aia_studies_reports.jsp.